Finally, It's Fun To Take Your Work With You"
The Mobile Translator from IdiomaX was just the thing for Andrew and thousands of other people like him who do translations on the go. How about you? Are languages an important part of your work or education? Would you like to read, write and speak more languages? Do you need to do translating away from the office or school? Do you travel to places where you don't speak the language fluently or at all? Are you a commuter who finds yourself with downtime you could use to work on your Nokia SmartPhone? It starts with a simple download of the Mobile Translator software to your Nokia cell phone, Smartphone, handphone or mobile device... that's all you need to start translating on the go. Mobile Translator for Nokia SmartPhone will always be on hand whenever you need a quick word look-up during a conversation, a language helper in a restaurant or on holiday, translation of an important client email or document, verb conjugation to prepare for a test, and a million other language tasks. And the best part is... it all fits in the palm of your hand. The IdiomaX Mobile Translator converts your Pocket PC or Smartphone into a mobile translation device that goes everywhere you do. Translate text, consult dictionaries, and conjugate verbs in five different languages without missing a beat in your busy schedule. Type in a word or snippet of text for instant translation. Select/copy a longer block of text to be translated. Translate text from webpages, emails, and documents. Use built-in language dictionaries to look up words and expressions. Conjugate verbs in 5 languages. Translate between 7 language pairs. Use storage cards to install more dictionaries for even more languages. Devices with 64 MB RAM and at least 10 MB free. 20 MB for each language pair installed in the main memory or storage card. Nokia PC Suite or any other .SIS installation program installed on your PC. 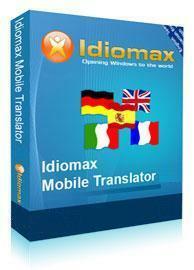 IdiomaX Mobile Translator for Nokia is compatible with most Nokia's smartphones running the Symbian S60 or Symbian^3 operating system. Lets you translate in five different languages, between seven language pairs. Translate anytime, anywhere you happen to be. Use downtime to brush up on vocabulary or verb conjugations. Send the translated text to other device by SMS, email, etc. Read websites and documents in languages you don't understand. Conduct international conversations on your mobile. Impress potential clients, your employer and coworkers. Get incredible accuracy and intelligent translations that you never would have expected from software. Add more languages by installing extra dictionaries. If your work requires language translation or you simply love languages, Mobile Translator for Nokia SmartPhone is the most important and enjoyable software you'll ever use. On the job, at school, or just for fun.